AT monolog: When I was a young man, I sailed across the great waters. I saw people of all kinds – living together as families, in the same quarters. They were asking me about the “new world” (amused)… this ancient land of our mothers and fathers. Them, with their eyeglasses and looking glasses and pocket watches and fancy carriages. They looked upon me and my friends with curiosity, so much that I won the attention of a beautiful young woman. (floating away) She had golden hair, and lips like rubies, and eyes as blue as the sky…. (catches himself) Ah – I am telling you too much. (back to earth, turning serious) but, in the eyes of the men, I saw a lust for adventure – to come over to our world and explore this “unknown” land. So, now they have come. Many have wives back in England, but they find our Cherokee women very attractive. And, our women find them to be ..unpredictable, unruly, engaging – with more than just hunting on their minds. 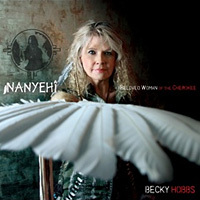 (focuses on DC) Nanyehi is a beautiful woman. She is still young. And Bryant Ward is a good man. (resigned, hands up in air) and Cherokee women have always done, and will always do what they want! (spoken) You cannot tell a woman who to love.